Triplaris americana is a species of flowering plant in the knotweed family known by many common names, including ant tree or pau-formiga ("ant tree"), guacamayo, guayabo zancón, hormiguero, palo de Santa María, tachí, vara santa, pau-de-novato, formigueiro, and taxizeiro. It is native to Central and South America, occurring from Panama to Brazil. It is also cultivated as an ornamental for its showy pink flowers. Originating from Central and South America, the Ant Tree belongs to the Polygonaceae family. This tree grows between 8-10m tall with a straight, smooth grey trunk with pyramidal crown. The leaves are poisonous and are bright green and smooth, or brownish-velvety beneath along the midrib and veins. Between April and May this tree produces small flowers in large clusters along densely greyish-yellow, light brown hairy axes. Female flowers are red and are found on separate trees to male flowers. Fruits are shiny and brown. Mass production of seeds allows for high rates of propagation. General description: This tree grows up to 8-10m and has a straight trunk with smooth, grey bark. Leaves: Leaves are bright green and smooth, or brownish-velvety beneath along the midrib and veins. Flowers: Small male and female flowers on separate trees from April to May in large clusters, along densely greyish-yellow, light brown hairy axes. 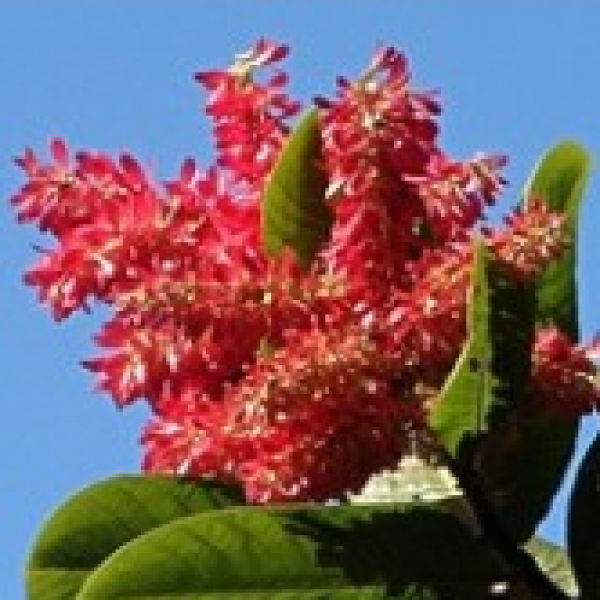 Female flowers are red. Fruit/seeds: Shiny brown, sharply three-angled seeds, held inside the fruiting perianth, 30-50mm long, with brown hairy base and three pinkish-red wings.